A Different Kind of California Dreaming! Lake Don Pedro is ideally located, less than 3 hours from San Francisco, Sacramento and San Jose. The easy-to-reach Lake Don Pedro, surrounded by rolling hills and oak trees, covers an area of 30,000 acres. Discover 160 miles of fascinating shoreline meandering the winding channels of Lake Don Pedro, which is so long a houseboater starting at the dam could cruise more than 20 miles up the main arm. Several tributaries drain directly into Don Pedro Lake allowing the water levels to remain high and the comfortably warm summer water temperatures provide excellent fishing and seemingly endless opportunity for water sports and fun. Lake Don Pedro Caters to a Variety of Activities! Houseboats have miles of shoreline to cruise, while water skiers can spread out across more than a dozen large bays and inlets. In the summertime, water temperatures average around 80° making Lake Don Pedro a favorite destination for water sport lovers. Imagine your day snaking the narrows of Lake Don Pedro... soaking in the views... and tipping you hat to the occasional houseboater or fishing boat. At lake Don Pedro you can seek out and claim your own private cove for a private picnic or a relaxing afternoon enjoying the warm Californian sunshine. Perhaps you prefer more of an adventure-filled day of wake-boarding and water skiing, or maybe fishing for that trophy bass. However you plan on spending your days on Lake Don Pedro, you will surely want to spend your nights relaxing and rejuvenating under the star-filled skies. The absence of city lights makes for some remarkable stargazing opportunities at Lake Don Pedro – a truly unforgettable experience accented by the laughter and the revelry of your family and friends as they forget about their cares and lose themselves in the magic of the moment. The Perfect Central-California Getaway Destination! Lake Don Pedro's irregular contours offers adventure and surprises around every corner. Don Pedro Marina can provide you with endless activities that include jet-skiing, windsurfing and wake boarding. We always recommend a "Water Toy" to add more pleasure and options to you houseboat vacation. If angling is more your style you will not be disappointed. 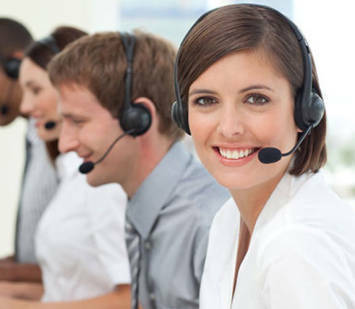 Catfish, crappie, sunfish, blue gill and carp are among the many fish species found here, but most come for king or silver salmon, rainbow trout and bass. Bass weighing up to 18 lbs have been caught here. This is a great lake for learning how to windsurf as there is plenty of space to practice the sport. 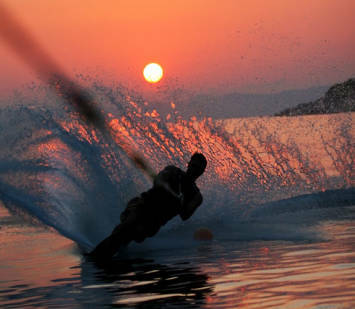 Jet skiing and wake boarding will appeal to those who want a little more speed and spray. Jet skiers will appreciate the numerous secluded coves that are just waiting to be discovered. There is a nice beach next to the marina for those that want a sand beach. There is even a 2 acre swimming lagoon that kids of all ages will enjoy. Lake Don Pedro has a full fleet of houseboats that satisfy every taste and every pocket. 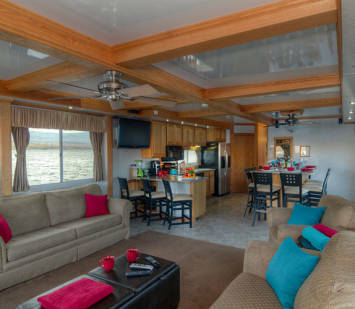 Even the standard-class 50 foot houseboats come well equipped with full kitchens, entertainment including TV/DVD, CD and stereo, even air conditioning and heat if necessary. 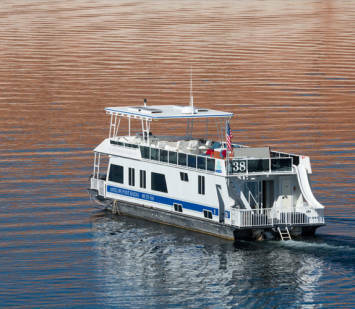 If you want to splurge a little or if you have a larger group take advantage of the high-class 70-foot houseboat that offers a very open layout to fit your needs. This spectacular vessel comes with upgraded interior décor and a stunning raised dining room table. The main salon has high ceilings, wrap around windows, and hardwood paneling throughout. The cabinets in the fully equipped kitchen is upgraded to premium wood and each of the four bedrooms feature a flat screen TV with DirecTV satellite. On the top deck relax in the 6-person hot tub and enjoy the rolling California hills as you sip a cocktail beside the upper-deck wet bar. If the sun gets a little too warm, take a plunge down your waterslide into the cool waters of Lake Don Pedro. The 70' houseboats even come equipped with a 47 gallon water toy fuel tank so you can fuel up your small watercraft without returning to the marina. As you can see today's houseboats are more like floating vacation homes – but better.